Blood clots that form after sitting too rigidly can travel to the brain, causing strokes. 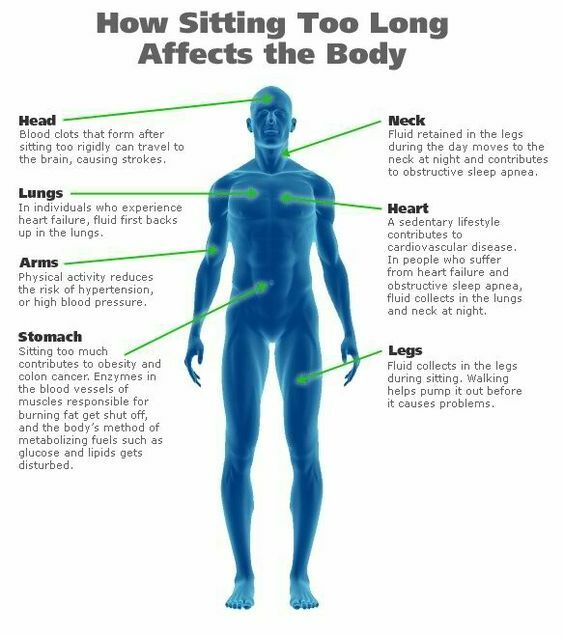 Fluids retained in the legs during the day moves to the neck at night and contributes to obstructive sleep apnea. In individuals who experience heart failure, fluid first backs up in the lungs. A sedentary lifestyle contributes to cardiovascular disease. In people who suffer heart failure and obstructive sleep apnea, fluids collect in the lungs and neck at night. Physical activities reduces the risk of hypertension, or high blood pressure. Sitting too much contributes to obesity and colon cancer. Enzymes in the blood vessels of muscles responsible for burning fat get shut off, and the body's method of metabolizing fuels such as glucose and lipids gets disturbed. 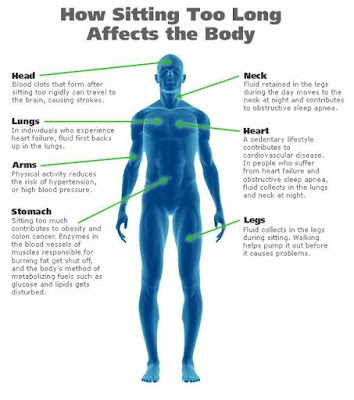 Fluids collects in the legs during sitting. Walking helps pump it out because it causes problem.